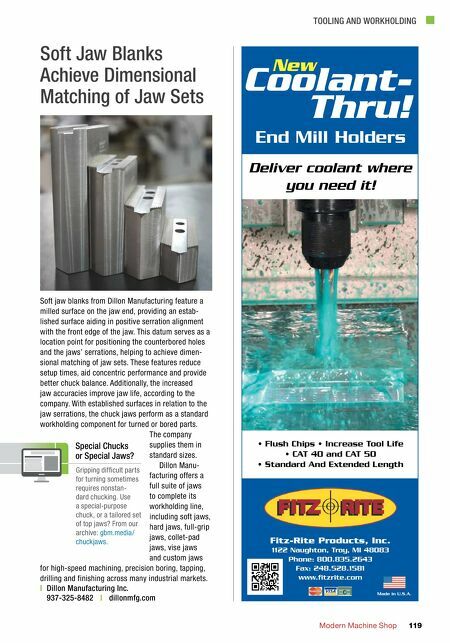 TOOLING AND WORKHOLDING Modern Machine Shop 119 Coolant- Thru! End Mill Holders New Deliver coolant where you need it! Fitz-Rite Products, Inc. 1122 Naughton, Troy, MI 48083 Phone: 800.835.2643 Fax: 248.528.1581 www • Flush Chips • Increase Tool Life • CAT 40 and CAT 50 • Standard And Extended Length Made in U.S.A. Soft jaw blanks from Dillon Manufacturing feature a milled surface on the jaw end, providing an estab- lished surface aiding in positive serration alignment with the front edge of the jaw. This datum serves as a location point for positioning the counterbored holes and the jaws' serrations, helping to achieve dimen- sional matching of jaw sets. 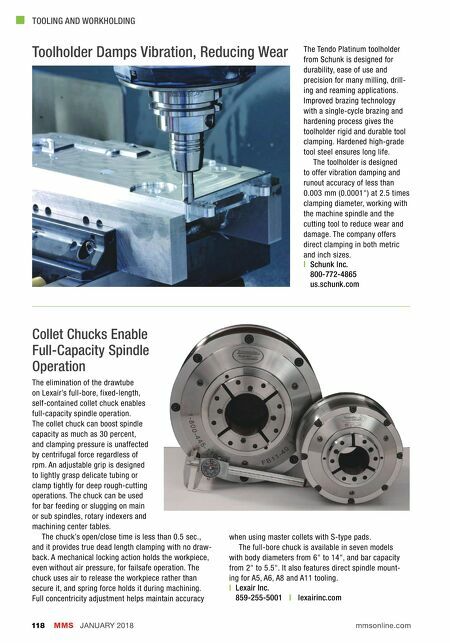 These features reduce setup times, aid concentric performance and provide better chuck balance. Additionally, the increased jaw accuracies improve jaw life, according to the company. With established surfaces in relation to the jaw serrations, the chuck jaws perform as a standard workholding component for turned or bored parts. The company supplies them in standard sizes. Dillon Manu- facturing offers a full suite of jaws to complete its workholding line, including soft jaws, hard jaws, full-grip jaws, collet-pad jaws, vise jaws and custom jaws for high-speed machining, precision boring, tapping, drilling and finishing across many industrial markets. | Dillon Manufacturing Inc. 937-325-8482 | dillonmfg.com Soft Jaw Blanks Achieve Dimensional Matching of Jaw Sets Special Chucks or Special Jaws? Gripping difficult parts for turning sometimes requires nonstan- dard chucking. Use a special-purpose chuck, or a tailored set of top jaws? From our archive: gbm.media/ chuckjaws.